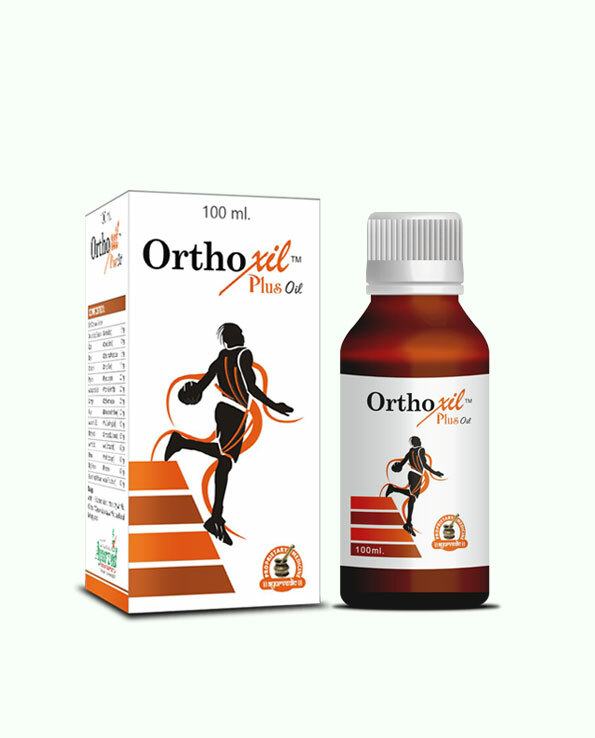 Orthoxil Plus oil is an ayurvedic anti inflammatory oil for arthritis that goes deep into the skin and enhances supply of nutrition and oxygen to cells of the joints. 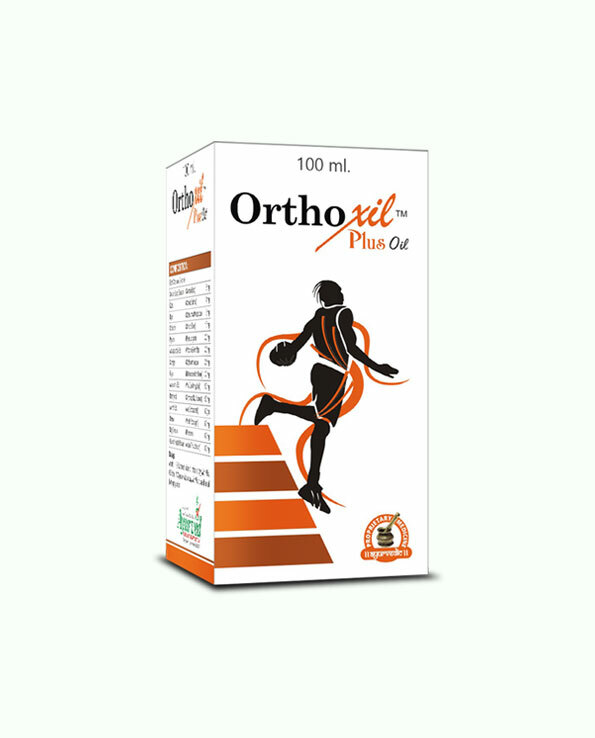 Orthoxil Plus oil comes loaded with herbs which are highly effective in relieving pain and diffusing swelling, this herbal anti inflammatory oil is recommended to people suffering with arthritis, ageing individuals and people leading strenuous lifestyle. This herbal anti inflammatory oil possesses herbs which go deep into skin and enhance supply of nutrition and oxygen to cells of the joints. Higher nutritional supply and oxygenation causes rapid cell generation to strengthen tissues, muscles, ligaments and other joint organs and keep them stronger and healthy. Powerful properties of herbal anti-inflammatory oil also keeps joints protected from infections and bone disorders to keep a person active and agile. Orthoxil Plus oil promotes flow of blood towards affected joints, this herbal anti inflammatory oil by diffusing swelling removes blockages and allows blood to reach troubled part, higher flow of blood let immune system take its effects and also provide more nutrition and oxygen to cells and tissues. Regular use of this herbal anti inflammatory oil not only keeps muscles, ligaments and other joint organs energized and strong but also prevents infectious agents from affecting joint mechanism. Use of this ayurvedic oil for arthritis pain relief along with calming symptoms of arthritis also improves joint stability and endurance. For people involved in heavy jobs or suffering with nutritional deficiencies due to untimely diet or unhealthy lifestyle this herbal anti inflammation oil is excellent aid to prevent joint weaknesses and lethargy. This herbal arthritis pain relief oil cures morning sickness, increases range of joint motion, and increase joint’s weight and pressure bearing capacities. 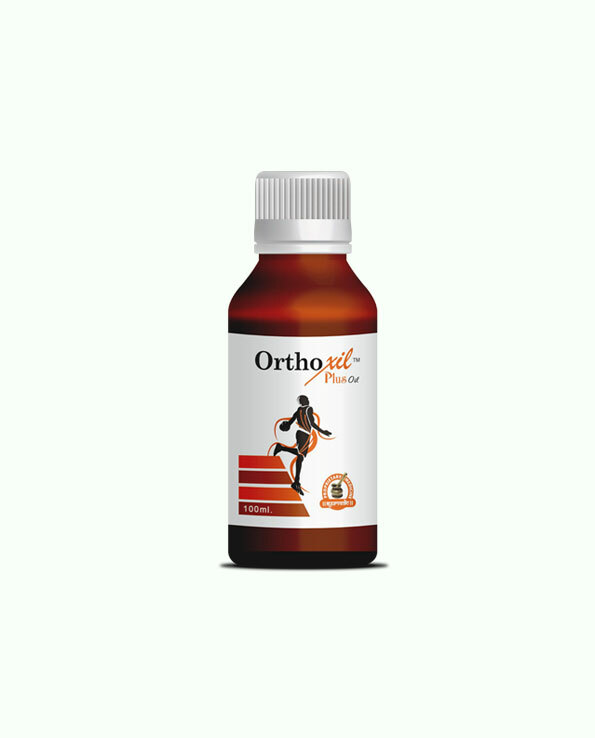 Orthoxil Plus oil is recommended for ageing individuals to protect joints from degenerative arthritis and stiffness and swelling due to weakness and misalignment of joints. Orthoxil Plus oil relieves pain and swelling in joints to promote movement. This herbal anti inflammatory oil is fast-acting and promotes movement even in arthritic conditions. 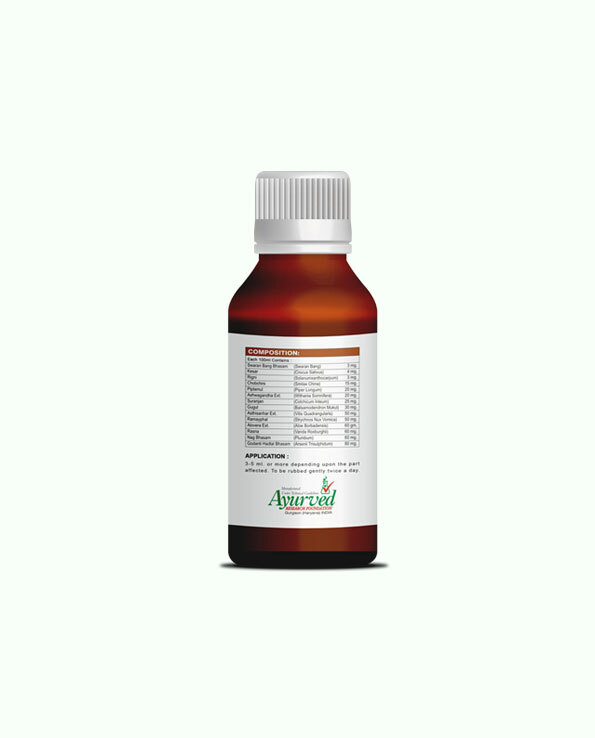 Regular use of this ayurvedic oil for arthritis pain relief initiates process of cartilage repair which get damaged due to arthritis, ageing and overuse. Once a person has healthy and strong cartilages joints remain strong and enduring for longer period in life. It also treats redness, warmth and tenderness in joints and even shields ill-effects of rheumatism over joints. This oil is beneficial in numerous joint, nerve and muscular problems. This herbal anti inflammatory oil can be used for relieving sciatica, frozen shoulder, cervical, spondylitis, muscular sprains etc. Men and women suffering with low back pain, stiffness in back or knees, or painful elbow, wrist and finger joints also gain immense relief by using this herbal arthritis pain relief oil. Orthoxil Plus oil is purely herbal and contains no artificial or synthetic material. This oil is harmless even for sensitive skin and does not cause mildest side effect even after prolonged use. This oil can be used by men and women of all ages and works for minor to major joint ailments effectively. Orthoxil Plus oil possesses powerful herbs and herbal oils as ingredients, these are – Ashwagandha, Asthisanhar, Arand, Rasna, Nirgundi, Guggul, Nagkesar, Piplamool, Haldi, Akarkara, Long Oil, Jaiphal Oil, Gandhpatri Oil, Gandhpurna Oil, Peppermint Oil, Tarpin Oil, Kapur Oil, Arand Oil and Buleylu Oil. These herbs and herbal oils are present in Orthoxil Plus oil in perfect combination to deliver safe, fast and wonderful effects. Using this oil is easy and simple, take 10 to 15 drops of oil and rub with light hand for few minutes till oil gets absorbed in the skin. Repeat twice or thrice in a day and maintain regularity. This oil can relieve pain and swelling in a short time but to gain maximum benefits it is recommended that one shall use it for at least 4 months. In presence of any disorder related to joints or bones duration of 6 months in recommended. We would recommend consuming foods high on minerals like calcium, and vitamins like E, D and C. Fruits, wholegrain, nuts and vegetables are rich sources of these nutrients which provide optimum support and provide powerful and strong joints and bones. We do offer facility of COD in India. You can also make payments through cheque, DD, NEFT and deposit cash in our account. You will get your order within 3 to 5 working days in India. We value your privacy and keep entire deal secret. You will get your order wrapped in a discreet packing which will provide no details about the product from outside. We use FedEx to ship our products to ensure timely and safe delivery. I read about Orthoxil Plus oil somewhere online and ordered it for my mother. She says that this has been a big help in arthritis. I’m really glad that I saw this and I know she will be ordering more. I had used this massage oil for 6 months and it took the back pain away. All thanks to this fantastic product. This will forever be in my grandfather’s life. He tried everything but this works the best. He massages daily and he feels amazing. His knees were a constant problem. This product actually relieves the pain in his knees. I am so happy to see him feel alive again and able to move around without so much pain. Excellent Product!! No negative side effects like other allopathic supplements!! I got this for my sister as she was always complaining about shoulder pain. Now there is significant relief in pain and stiffness. Will buy more!! Works magic!!! A good pain reliever.